IRVINE, Calif., Feb. 6, 2017 (SEND2PRESS NEWSWIRE) — 5 BARS®, a premier provider of wireless master plans and marketing agreements for cities and municipalities across the United States, announced today an agreement to develop a Wireless Master Plan for the City of Twentynine Palms. 5 Bars is an Irvine, California, privately held premier provider of Wireless Master Plans for Counties, Cities and Large Scale Venues developing comprehensive wireless strategies through a unique holistic view of all assets, coverage and capacity. 5 Bars offers fully managed wireless solutions, network development, ownership and end-to-end management delivering commercial indoor and outdoor distributed antenna systems (DAS), carrier-grade Wi-Fi networks, and small cell systems on behalf of properties and service providers. 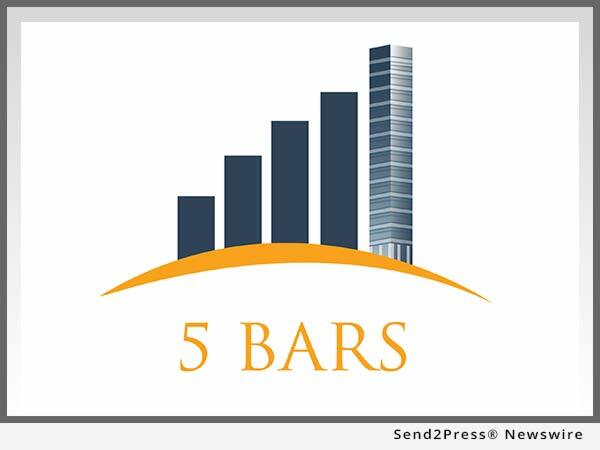 For more information, visit http://www.5bars.com/. The City of Twentynine Palms is the home of Joshua Tree National Park Headquarters and Main Park Entrance (aka the North Entrance) and proud host of the Marine Corps Air Ground Combat Center, the world’s largest Marine Corps training base. The City is renowned for its world class murals and artists, supportive business climate, pristine air, beautiful natural surroundings, desert and mountain vistas, and friendly family lifestyle. Beyond the last of the traffic lights, we are the gateway to the Mojave Desert, Joshua Tree National Park, the Mojave National Preserve, and the great California Outback. Enjoy our website, but we also invite you to experience the history, culture, lustrous starlit skies, breath-taking sunsets and sunrises in person. "We are excited to be working with the city's progressive leadership and contributing technology and smart infrastructure planning that will positively impact its citizens for many years to come," said Greg Steininger, National Vice President of 5 Bars.